Abrams, the first black woman to deliver an official response to a State of the Union address, touted bipartisanship but took aim at GOP leaders and voter suppression. "Let's be clear: voter suppression is real," Abrams said Tuesday night, adding "we can no longer ignore these threats to democracy." WASHINGTON — Stacey Abrams called the recent government shutdown a "stunt engineered by the President of the United States" in the official Democratic response that followed President Donald Trump's State of the Union address Tuesday night. "The shutdown was a stunt engineered by the President of the United States, one that defied every tenet of fairness and abandoned not just our people — but our values," said Abrams, the first black woman to deliver the State of the Union response. 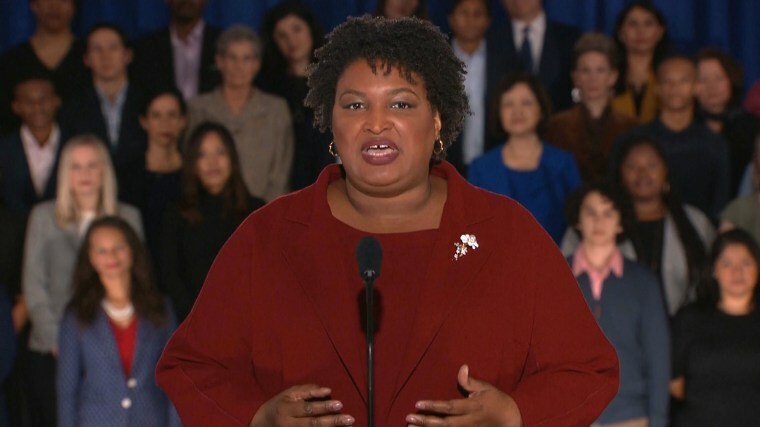 Abrams, 45, the former Democratic leader of the Georgia House, became the first black woman in the country to win a major party nomination for governor in the 2018 midterm elections. Although she ultimately lost, she won more votes than any other Georgia Democrat in a statewide election. Still, she was an unexpected choice to deliver the Democratic response to Trump’s State of the Union address. The 53-year tradition is a coveted speaking spot historically reserved for up-and-coming elected governors, senators or representatives. Abrams never officially conceded to then-Georgia secretary of state, now Republican Gov. Brian Kemp, amid controversy over allegations of voter suppression. "We must reject the cynicism that says allowing every eligible vote to be cast and counted is a 'power grab,'" she said, an apparent reference to a recent remark by Senate Majority Leader Mitch McConnell, R-Ky., regarding a proposal that would make Election Day a national holiday. "Americans understand that these are the values our brave men and women in uniform and our veterans risk their lives to defend. The foundation of our moral leadership around the globe is free and fair elections, where voters pick their leaders — not where politicians pick their voters." Abrams took aim at the GOP, saying that many "families' hopes are crushed by Republican leadership that ignores real life or just doesn't understand it." "Under the current administration, far too many hard working Americans are falling behind, living paycheck to paycheck, most without labor unions to protect them from even worse harm. The Republican tax bill rigged the system against working people," she added. But she also made a brief call for political unity. Although Abrams differs with President Trump on nearly every issue, she said, "I still don't want him to fail."